For Financial Consideration: January 15 for Fall. September 1 for Spring. Otherwise: March 1 for Fall. October 1 for Spring. The Computer Science and Engineering Department at the University of Nebraska-Lincoln offers graduate programs in computer science and computer engineering leading to master's and doctoral degrees. 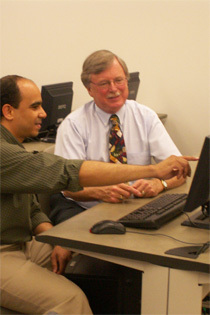 The graduate programs increase students' breadth of knowledge and develop depth of expertise in a subfield of computer science and engineering. The graduate programs offer opportunities for students to develop teaching skills in support of undergraduate instruction and to enhance research skills in support of the department's active research programs. The goal is to build a foundation for future scientific discovery, engineering innovation, and scholarly and professional achievement. Informatics areas of research include: bioinformatics; computer vision; constraint processing; data mining; databases; geographic information systems; image analysis; simulation and modeling; visualization; algorithms; computational complexity; intelligent agents; machine learning; and semantic modeling. Software engineering research areas include: methodology; maintenance; program analysis; programming languages; and software testing and reliability. Systems and networking areas of research include: collaborative technologies; distributed computing and storage; embedded systems; sensors and sensor networks; networking; real-time systems; and security. The Ph.D. program in computer engineering is supported jointly by the faculty in the computer science and engineering department at the University of Nebraska-Lincoln and the computer and electronics engineering department at the University of Nebraska at Omaha, 50 miles away. Students on both campuses work closely with faculty and with professionals working in the field and industry. For additional details check out the dept./program website: Computer Science and Engineering.